Among the important ruins situated upon the acropolis in Athens is the Erechtheion, a unique sanctuary dedicated to Athena Polias; Poseidon and Erechtheus were worshiped here. Erechtheion at Athens. Photo by Leon Mauldin. 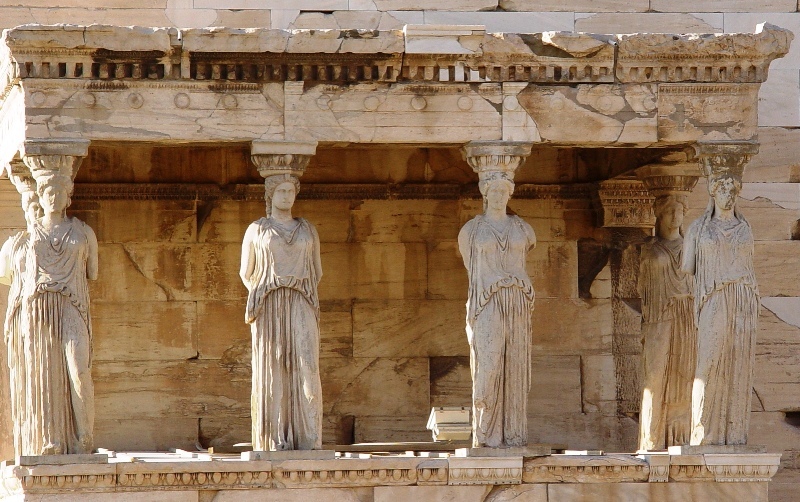 This view shows the Porch of the Kayatids, which used female figures as architectural supports as columns. These figures are a representation of the “Maidens of Karyai,” an ancient town of Peloponnese. The structure dates to the 5th century BC. Close-up of Porch of the Maidens. Photo by Leon Mauldin. These maidens are actually replicas. The originals are encased in glass in the museum. More to come. Click on image for higher resolution. This entry was posted on Tuesday, January 18th, 2011 at 9:08 PM and is filed under Athens, Bible History and Geography, Bible Study, Greece, Travel, Uncategorized. You can follow any responses to this entry through the RSS 2.0 feed. You can leave a response, or trackback from your own site.